The two countries have held annual naval exercises since 2003 but this is the first occasion that both will combine all military services. 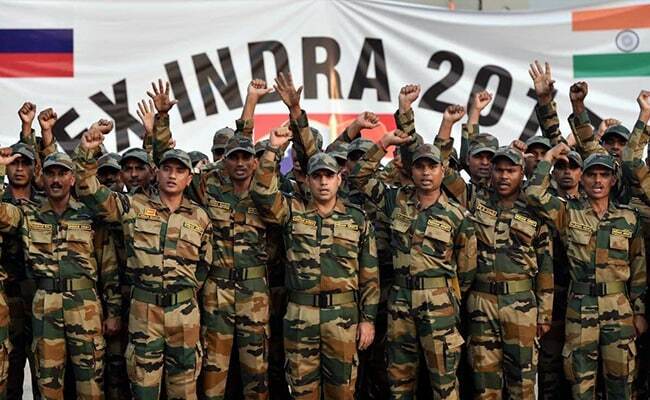 New Delhi: India and Russia will hold large-scale military exercises engaging their armies, navies and air forces for the first time, said the Defence Ministry. They come on the back of regional tensions, with Delhi and China ending a months-long military stand-off at the strategically important Doklam Plateau across the border at Sikkim. China has been expanding its naval presence in the Indian Ocean and building infrastructure in Sri Lanka, Bangladesh and Pakistan, which has riled Delhi. The October 19 - 29 joint war games will kick off in the eastern military district of Russia, the ministry said in a statement. "The year 2017 marks a major milestone as this exercise has been upgraded to involve all the three services of the armed forces (Army, Navy & Air Force)," the statement said. The games "will provide an opportunity to the armed forces of both countries to train in counter terrorism operations in a multinational scenario in a joint tri-service environment". India will send 350 personnel from its army and 80 from the air force, and military hardware including two aircraft and a frigate, while Russia will have about 1,000 troops. Apart from anti-terrorism drills, the exercises will include professional interactions and establishment of joint command and control structures.